More than 1600 party workers cuddled at New Sports Club building at Lumla in Tawang of Arunachal Pradesh, which ran out of its sitting capacity, to attend the Bharatiya Janata Party’s (BJP’s) district executive meeting on Thursday. The proceedings rolled, as district BJP president Sange Chodup felicitated Lumla MLA Jambey Tashi on being inducted as the national executive member of BJP Minority Morcha. Jambey in turn, honoured Sangey Tsering Thungon, who replaced former MLA Naresh Glow as the Tawang district in-charge. Opening his statement, local MLA Jambey Tashi stressed on robust propagation and enlightenment of multiple central and State Government schemes at grassroots level for maximum benefits. The skill development parliamentary secretary also emphasized on learning various trades for making a living under ITIs and not remaining inclined on contract works and government jobs alone. “Working in line with Prime Minister Narendra Modi’s vision of channeling the country’s youth power, the Pema Khandu government under Pradhan Mantri Kaushal Vikash Yojana, has initiated to empower 86,000 youths under different trades by 2020 for an economically vibrant state”, he informed. Further, Jambey Tashi, who is also the parliamentary secretary for RWD spoke in length on various sectors like education, health, environment and culture. In his speech, Tawang MLA Tsering Tashi appealed for peace and unity for the prosperity of the region. He also urged for contribution of land and space for developmental projects for social, cultural and economic development of the district. “Lumla is at the zenith of progress and at the peak amongst all the sub-divisions of the State. It at present is the foremost constituency of the State in terms of development”, he said, congratulating the residents of the hamlet. 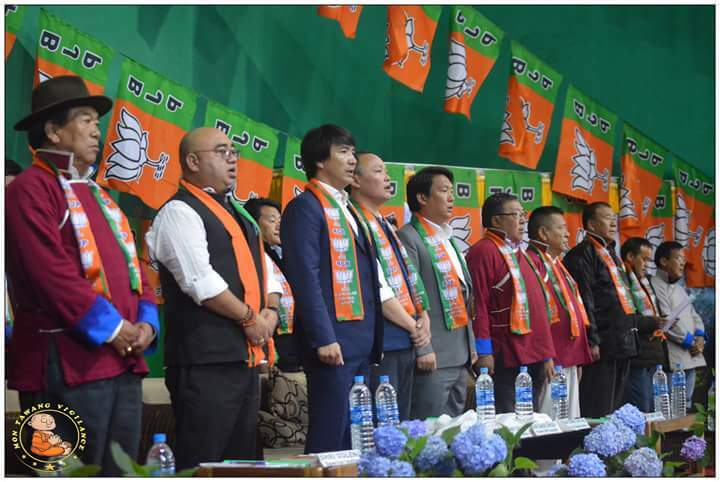 Sange Tsering Thungon elaborated on the various ideologies and achievements of the Central and State Governments under the stewardship of Prime Minister Narendra Modi, Chief Minister Pema Khandu and BJP supremo Amit Shah. He called on the party workers for strict adherence of the ideology ‘Nation first, Party second and self last’. Earlier, BJP district executive member Jowa Tsering moved the political resolution while BJP legal cell co-convenor Pema Chowang placed the economic resolution, which was seconded by district BJP vice president Tsering Tashi and Tawang BJP mandal president Lhendup Chosang, respectively. The resolutions were unanimously adopted by the House. Flat televisions were also disbursed to the gaon burahs (village headmen) during the assembly. District BJP president Sangey Chodup, special invitee and senior public leader Goleng and former ZPC Jambey Tsering also addressed the gathering.